The original installation included two horse troughs [one of which had been replace by a modern copy in 1992]. 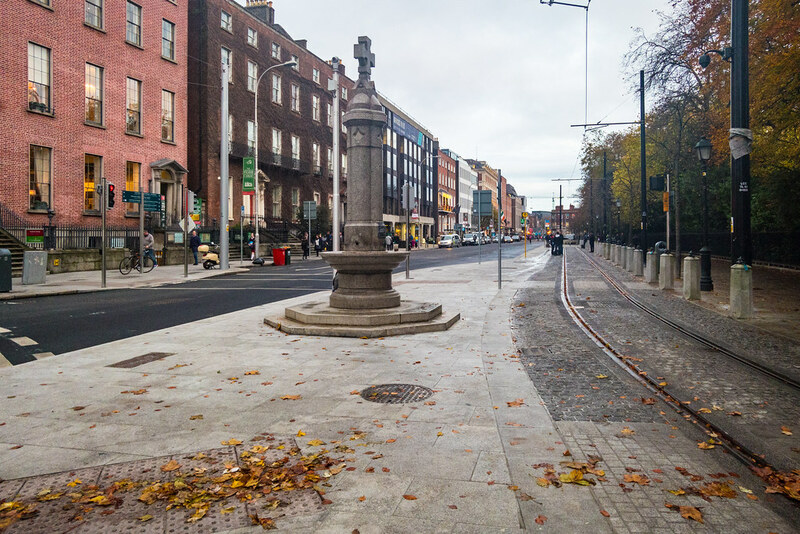 The contract for Luas Cross City heritage works was awarded to KN Network Services (KNN). Various items of historical and cultural significance had been carefully removed by the Contractor to secure storage for a period of up to two years and have been returned during the last few months. The heritage works began in 2014 with the successful removal to storage of the Lady Grattan Fountain at St. Stephen’s Green. The fountain which dates from 1888 was in excellent condition and was returned close to its original location this year. Close inspection of the fountain and troughs had shown that some repairs which were carried out in the past have given way. Some new repairs to the stonework were recently undertaken. The Lady Grattan Fountain was presented by Lady Laura Grattan (daughter in law of the patriot Henry Grattan, M.P whose statue stands in College Green) to the citizens of Dublin in 1880. The fountain was presented to the citizens of the city at a time when running water was only supplied to a small number of houses in the capital. 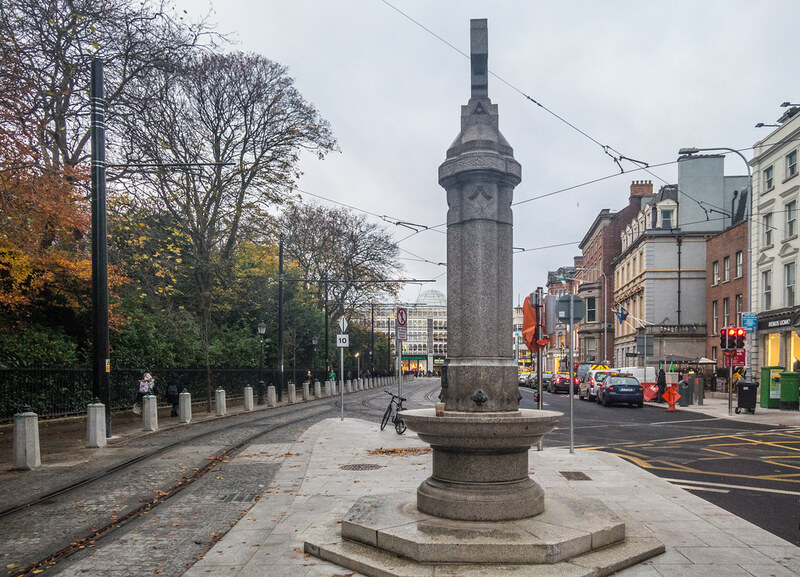 The installation of fountains like this one in other locations within the city centre helped greatly in improving public health and hygiene generally. It consists of a drinking fountain carved from polished granite stone. The cylindrical base supports a basin from which rises a quatrefoil shaft surmounted by a small Celtic cross. Decorative bronze spouts and fittings (some of which are missing) are set into the quatrefoil shaft. Drinking cups would have originally been attached to the shaft to allow people to quench their thirsts, while horses would have been able to drink from the basin. Flanking the structure are two granite rectangular troughs mounted on squared pedestal blocks. These troughs are likely to be unrelated historically with the drinking fountain and may have been brought from elsewhere during the twentieth century. In 1992 the fountain was restored by Dublin City Council. The work involved bringing drinking water back to the fountain and replacing worn bronze castings, spouts and access doors. One of the horse troughs, which was badly damaged, was replaced by a modern copy.